Discussion in 'Work in Progress' started by JackTurbo, Apr 10, 2018. 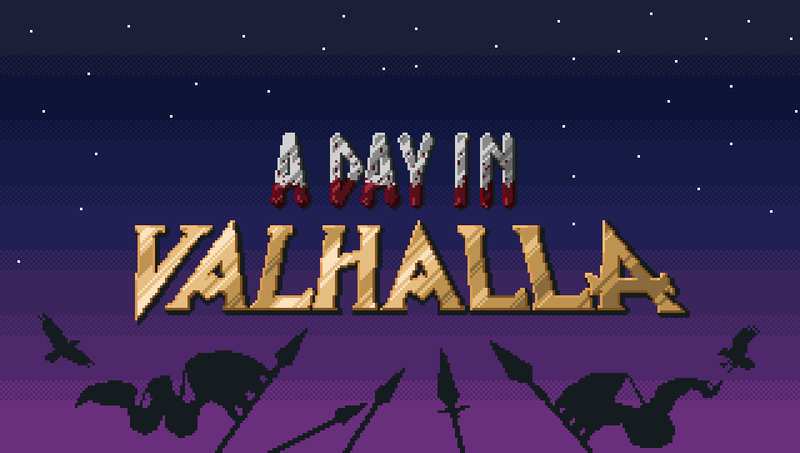 A Day In Valhalla is an upcoming hack-n-slash rogue lite for windows pc's. 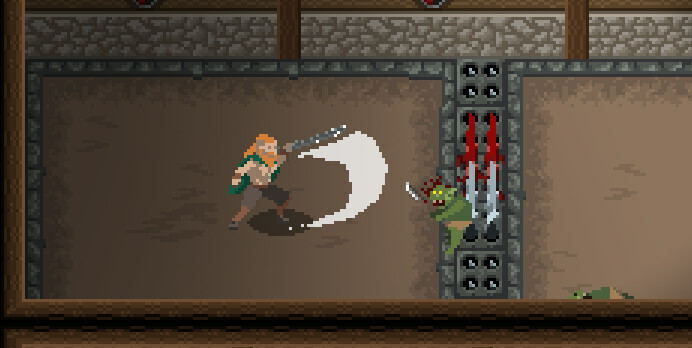 You play as a fallen viking warrior who is taken to Valhalla to train with Odin in preparation for Ragnarok. Each run represents one day of your training where you fight through randomly generated dungeons full of enemies taken from both pop-culture fantasy settings and traditional norse mythology in an effort to return to the Odin's great feasting hall of Valhalla in glory. FallFlat, Siavellez, jonjons and 23 others like this. Thanks man, super appreciate the encouragement. Tried capturing some gameplay with obs, but it absolutely tanks my frame rate. Gonna see if shadowplay wants to work any better and hopefully post some basic gameplay gifs soon. Looking good, I like the art style and animations! nice, what are the controls for the game? Currently on keyboard: WASD to move and lmb to attack in the direction of the cursor, space to dodge roll and left shift to sprint. On a pad: left stick to move, X to attack (in the direction your facing), left trigger to sprint and A to dodge roll. great concept and art so far. Rivo, Niels, RichHopefulComposer and 1 other person like this. You got me Rich, they're just a background layer over my tilelayer with a big gradient sprite. I reckon I can get away with that approach because 1. my game is super low resolution and 2. because the number of rooms in my game will only really be 3-4 dozen. Joe Ellis, BaBiA Game Studio and Siolfor the Jackal like this. Playing around with my movement code. Added acceleration/deceleration and tied the sprite (walk or run) and the image_speed to the current speed rather than based off input. Getting weird hitches in the animation, which I think is due to the irregular image_speed and the way gms rounds image_index to pick subimages to display. Still, I think there is a real improvement here (albeit one that needs refining). Rivo, Maxim Grachev, Medeival and 6 others like this. I like the setting! Main character is a bit too pixely for me but the style looks great. CMAllen, Rivo, Maxim Grachev and 6 others like this. Looks great so far! I like the fact that the game is zoomed in enough that you can actually see your character and not feel like an outsider looking in! RichHopefulComposer and JackTurbo like this. RichHopefulComposer and kupo15 like this. Looks even better! I think your game size is perfect, nice job! I like your project so far. The goblin spiking himself is gold ! However I have a comment about your character running. I think your camera behavior is wrong. The more you run, the less space you see in front of you. This might end up frustrating, it should be the opposite. The faster I run, the more the cam should space in front of me so I can actually react to what's coming. Glad you like it and good catch on the camera, rewriting my camera controller is on my agenda. Those animations are fantastic! Game looks great! 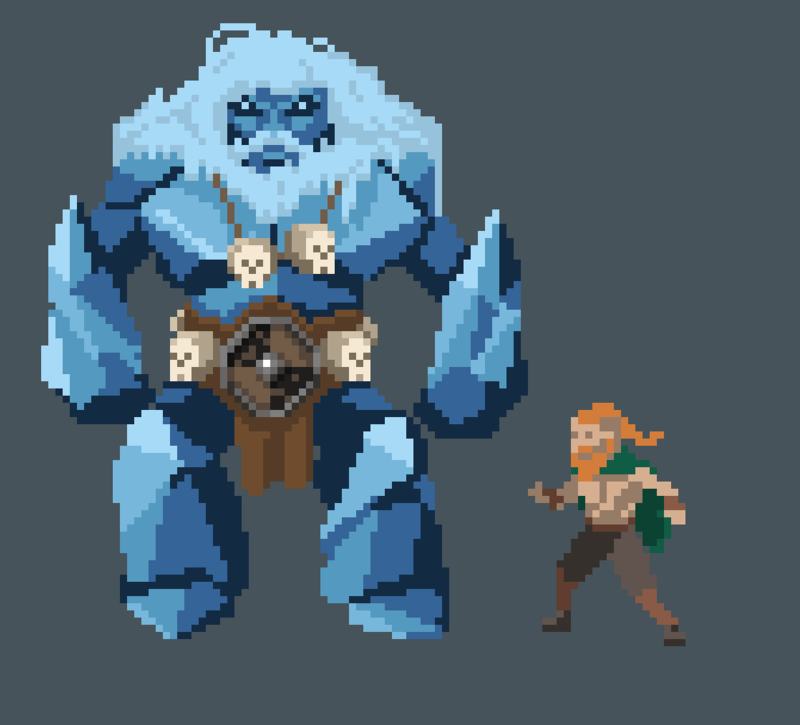 Working on my first boss enemy. ReidDC, Geoff Jones, FROGANUS and 8 others like this. Woah... now that's a nice first boss! 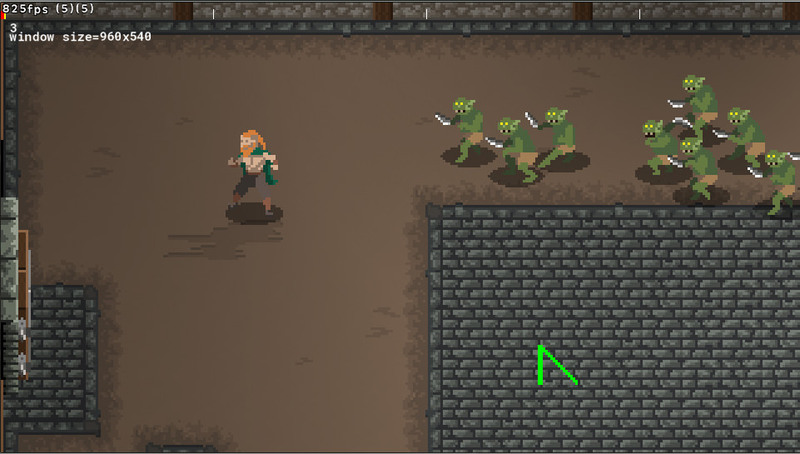 Working on my next enemy type. RichHopefulComposer, Nocturne, ChimaereJade and 1 other person like this. Hey thats pretty good stuff. Good necromancy. Now you have to post again, Jack! Glad you like it Snotwaffle (great name btw). Games on hold ATM as I'm traveling round Asia, will 100% be resuming once I get back to my native UK though. Im sat at a coffee place at a computer mall* in Bangkok right now as I might be buying a laptop. So who knows some more progress might be made in my downtime before my return. *Yes you read that right, they have entire malls dedicated to computers and computer parts/accessories out here! FROGANUS and SnotWaffle Studios like this. The Game looks just fantastic! Totally love the art and animation! Keep it up! Anyways, glad to hear it, good luck with everything, dude.